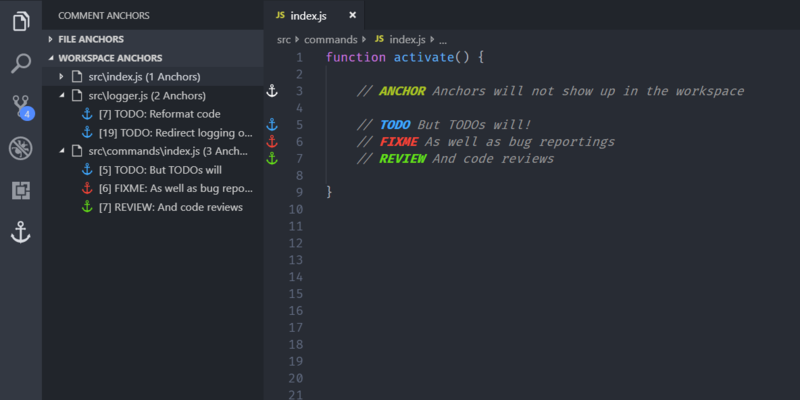 Visual Studio Code>Other>Comment AnchorsNew to Visual Studio Code? Get it now. Place anchor tags within comments for easy file & workspace navigation. Place anchors within comments or strings to place bookmarks within the context of your code. Anchors can be used to track TODOs, write Notes, create foldable section, or to build a simple navigation, making it easier to navigate large files. Anchors can be viewed for the current file, or throughout the entire workspace, using an easy to use sidebar. 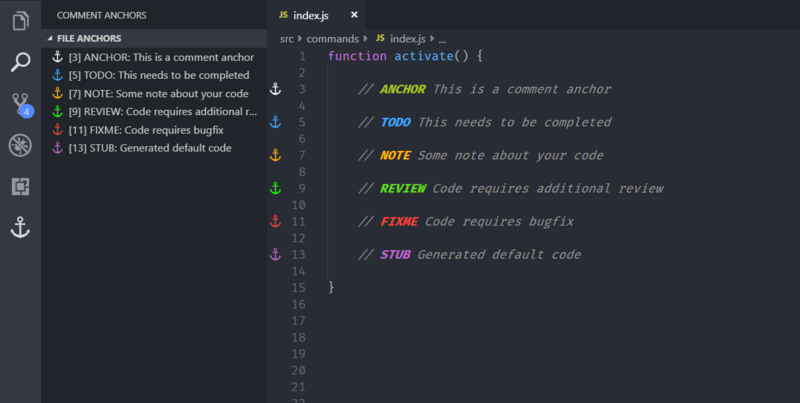 Comment Anchors provides many configuration options, allowing you to tailor this extension to your personal workflow, and increase productivity. Check below for a complete list of featured! Place anchors in comments, strings, documentation, etc. Anchors can be viewed in the anchor sidebar view in the activity bar. Click an anchor in the sidebar view to scroll it into view. In order to make an anchor, simply place the tag name in a comment, with an additional anchor message behind it. The anchor will be automatically detected and added to the Anchor List in the activity sidebar. All anchor types have their own icon, highlight color, and background color, and more, which can all be customized in the settings. Anchor tags can be added and removed, and can share the same icon or color. In case you want to disable one or more default tags, simply set the enabled property to false (See configuration section). Besides displaying anchors found in the current file, the sidebar also displays a list of tags it found across all files in your workspace. These anchors are displayed per file, and can be used as quick navigation. The visibility of anchor tags in the workspace list can be altered using the 'scope' property on each tag (See configuration section). Since workspace anchors are usually scanned at startup, this can increase load time for projects containing many files and folders. In this case you can enable lazy loading mode, which will require an additional manual trigger to start the scan. Lazy workspace loading can be enabled in the settings (See configuration section). Region Anchors allow you to group relevant Comment Anchors together in regions, which can be folded in both the sidebar and the editor. These anchors act nearly identical to regular anchors, however they require an "end tag" to be specified, which is simply a tag of the same type, prefixed with an exclamation symbol. In order to mark a tag as Region Tag, set the isRegion property to true in the tags configuration (See configuration section). A default region tag is provided, called "SECTION"
Comment Anchors supports a vast range of tag customization options. All tags can be modified, including the default tags. This allows you to define tags useful for your workflow. See the configuration section for a complete list of tag properties. Comment Anchors can be autocompleted by IntelliSense. Simply start typing an anchor name, or the text "Anchor". This will promt you with a list of anchors to insert. Displays all configured tags in a preview tab, useful for when you are creating your own tags. Toggles the visibibility of comment anchors (Duh!). Note that his command will update your settings in order to toggle the visibility. Use commentAnchors.workspace.matchFiles to define which files are scanned by Comment Anchors. This setting can be used to greatly increase performance in your projects, as by default most files are scanned. Use commentAnchors.workspace.excludeFiles to define which files are excluded from being scanned by Comment Anchors. This setting can be used to greatly increase performance in your projects, as by default only few directories are excluded. Use commentAnchors.tags.sortMethod to set the method used to sort anchors by in the sidebar list. Set this to "line" to sort by line number (Default), or "type" to sort by tag type. Use commentAnchors.tags to configure the anchor tags. Below is a list of properties each tag can have. In case you prefer backgrounds on all tags, here is an example setup using background colors. Simply use this JSON as the commentAnchors.tags configuration to use. Comment Anchors provides an array of different icon colors. Here is a list of anchors together with their hex code. You can use these colors as value for the highlightColor property on tags, to make the highlight color fit with the icon color. If you prefer more direct help, you can join the Exodius Studios Discord where you can find most developers of this extension. Comment Anchor scans your entire workspace for tags. This can cause bad performance when your workspace contains many files, such as dependency directories and logfiles. It is therefore advised to alter the matchFiles and excludeFiles settings to limit the amount of directories and files scanned. If you'd rather disable workspace anchors all together, you can disable these in the settings. You can contribute to comment-anchors by forking the GitHub repository and submitting pull requests.